Scorpions and Scorpion control Sydney. Micropest Scorpion pest control Sydney is a prominent long-standing established Scorpion and Scorpion control company based in Sydney Australia. These creatures have greatly enlarged grasping appendages arising from the anterior end, similar to those of crab. The uninitiated regard these with some fear when the dangerous part, the sting, is at the tip of the so-called tale which can be bent forward over the back of the body when the Scorpion strikes. In some countries scorpions account for a significant number of human deaths. In Sydney they are seldom seen but this does not mean that they are rare. Mostly they spend their lives under rocks and even when disturbed retreat rather than attack. 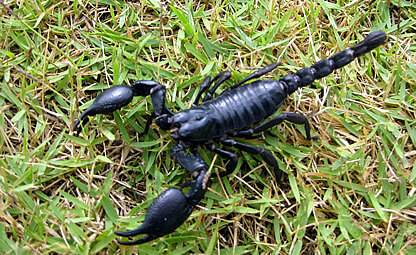 Scorpion Control is not normally required, but on the rare occasions when chemicals may be needed, those recommended for ground dwelling spiders are relevant. The common marbled species, about 35mm in length, is occasionally seen and may even wander into a house in bushland. Stings are very rarely recorded and with this species a string results in only a half an hour or so of fairly severe pain. It would be most unlikely for the one person to experience a series of stinging s and hence the danger of sensitisation is extremely remote in Sydney.